After graduating in December, the most common thing I have been asked is "so what are your plans now?" And to that I typically answer with "I'm not sure, I'm looking, but I also have a feeling that the right job will come along and fall into my lap." Some people meet that with a smile and tell me how great and optimistic I am. Other people meet it with a grimace and say "Oh, well it's okay to just get a job and get some more experience". And while that may be optimal for their life, it's not mine. It's so easy to fall into a routine, but I'm here to tell you that you need to stop settling for less than you deserve. I'm a big believer that the universe is always listening and watching. Sounds a little creepy, but we were totally down for it when Santa was involved. If you don't like the term ~the universe~, I'm also a big believer that God, the Universe, Source Energy, and all that higher power lingo is synonymous. For the sake of this post, I'm using the term universe. Get it? Got it? Good. So here's the thing: If you settle for something that doesn't light you up, even if it's "temporary" (is it ever really temporary? ), then the universe is going to say "wow, she doesn't think she's worth that $70,000 a year job." And even though you might think that you want it with all your heart, you're not sending a sign out that you are ready for it. Although I really wish it did, the universe just doesn't work like that. The universe is literal. Very literal. You tell the universe that you want a car? You'll probably end up with a hot wheels toy. And while that might be nice and dandy for someone else, you want something you can pick up your hot date in. So YOU need to get literal too. Grab a journal, sit down, and plan out your dream life. Write down everything you want. An all black 2019 Toyota 4Runner with tan interior, a $70,000 salary at XYZ company being a social media director, a partnership that is patient/kind/loving, and get SPECIFIC. How will you feel when you have those things that you want? Write that down too. Don't worry about how you're going to get them, leave that up to the big U (yep, I just called the universe that). This, my friend, is what the law of attraction and manifestation is all about: sending a clear view of what you truly desire to the universe. That doesn't mean that you only take take take. You also need to be grateful for what you already have, as well as be grateful for the things that will come to you. I have a blog post coming out soon that will focus on 30 days of gratitude journaling. If journaling isn't your cup of tea, then just take the time every day to list out at least 3 things you are grateful for that day. It can be a mental list, or you can use the notes section in your phone! Even if you just laid in bed all day, you can be grateful that your life allows you to do that. You can also be grateful that you have a roof over your head. Another thing to be grateful for is that you own at least some sort of technology, or else you wouldn't be able to read this blogpost. Celebrate small moments just as much as the big moments. Let the universe know you see it, and that you appreciate it. This whole concept is similar to praying....funny how that works, huh? So back to what I was saying about settling on a job. I know that a lot of people have your best interest at heart, and they genuinely want you to succeed in life. But also, sometimes you need to look at the person's life who is pushing you to do something that may not line up with your own personal truths. Are they truly happy? Did they settle for a mediocre life? If you answered no and then yes, well, you can still love them. But I wouldn't let them run your life, because it doesn't seem like they did a great job of their own. Tough love, sorry bud. I want you to live your best life. 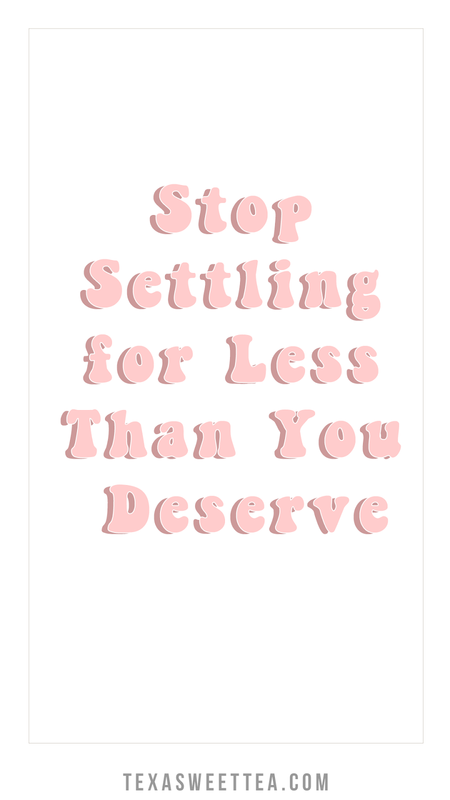 I want YOU to not settle for anything less than you deserve. And guess what? The universe feels the same way about you. It wants to give you everything that you can handle. It wants you to succeed because it made you! You are basically its little baby, and although it wants you to have the perfect life, it also doesn't want you to be fearful or anxious or scared. That's why being specific is so important. When you settle for a job, you're settling because it's comfortable. You are not fearful of the unknown because you know that you have a place to plop down and get to work for someone else. So if you're somewhat satisfied, but feel no fear of the future, then the universe is satisfied too. It's not going to bring you this amazing opportunity where you can be your own boss and work from home. Why would it, when you so obviously don't think you're worth it? But helloooooo, we're about to get real cliche. Life is too short to not do everything you dream of, but it's also long enough to change the path that you are on right now. If you are unhappy, do something about it! There are people out there living your dream life because they are the ones who decided to get off their asses and do something about it. If you just rolled your eyes and said "Well that's easy for you to say. You don't have xyz to worry about." Well, you're right. I don't worry about much because I don't let myself. Things have a way of working themselves out. In my 22 years of life, I have learned the more I leave my life up to the hands of the universe, the more success I have. The more I trust that the right things will happen to me and for me, the more things that seem to effortlessly happen in my life. I know settling isn't just something you wake up and stop doing. It takes time because we've been fed the same thing over and over again. You graduate high school, you go to college, you get a job, you get married, have kids, retire, then die. Make your life more than that. Make it so unbelievably fabulous that you spark other people to stop living crappy mediocre lives that they settled for. Be open minded, purchase a journal, and let your life transform. If you exit out of this post thinking I'm some hippie who has no idea what I'm talking about, then I at least hope you take away one part of this advice, and that is to stop settling for less than you deserve.